So at Austin last weekend, I turned out to be the audience member whose birthday was closest to that of Cynthia Leitich Smith, and so I won a copy of Feral Nights (Candlewick, Feb. 2013). I had not sought out her four earlier books, that comprise the Tantalize series, because they did not sound quite my thing, but I had been meaning to find this one, because it stars a werepossum! And not only a werepossum, but one who moves from sidekick status to hero of his own adventure- and being a reader with a fondness for the underdog, this also piqued my interest. Feral Nights is a side story to the first four, taking place at the same time as Diabolical, and featuring characters who played secondary roles in those books. There are many references to the events and places and people I wasn't familiar with, but although my conscious mind noted all this, my reading mind was able to ignore it all in much the same way that one unfamiliar word doesn't have to kill the sense of a sentence. 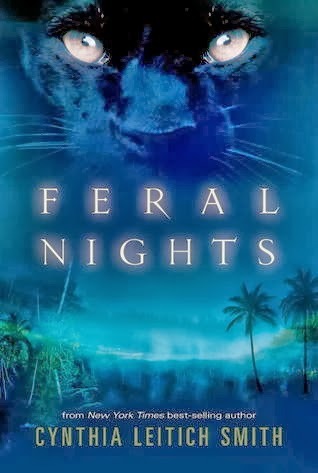 In short, Feral Nights reads just fine as a stand alone, and I think I actually enjoyed it more because of knowing that all the luxurious backstory was there (I like backstory, whether it's written down on the page in front of me or not). But in any event, Feral Nights tells how Clyde, a werepossum, a human girl named Aimee, and Yoshi, a werecat, have to a. figure out who killed Clyde's werearmadillo friend Travis b. track down Yoshi's missing sister Ruby c. escape alive (along with other werepeople) from an insane hunt on an island resort of murderous insanity ruled by a very strange species indeed who have a demon as their chef. Good times. The plot is just close enough to the top to be delightful, without going over it into farce. The characters care about each other, and have plausible relationships of meaningfulness. And it's funny, full of zesty dialogue and lots of geek culture references. The one thing I didn't care for was a bit of magical healing. Clyde's transformation from injured possum teen to something quite different was a bit disappointing to me--wounded possum boys can be heroes too, and be worthy objects of love/lust, just as much so as any flashy alpha predator. That being said, just as soon as I finish the 250 books already in my house, I will go back and read the first four. And regardless, I'll be looking for Feral Curse, coming this February from Candlewick. Cynthia Leitich Smith is a tribal member of the Muscogee (Creek) Nation, and so Feral Nights is the first of what I hope will be several links I offer to this year's More Diverse Universe Blog Tour, celebrating diverse authors of speculative fiction. And werecat Yoshi counts as a non-white protagonist, so I'm adding this to my multicultural sci fi/fantasy book list as well. In any event, thanks so much, Cyn, for the book! I read it on the plane back from Austin, and enjoyed it lots! I am not usually into books about werepeople but if this one has fun and witty dialogue and an entertaining/amusing plot, then I'm all for it! I've also never heard of this author, so thanks so much for bringing her to my attention! And thanks for participating in the blog tour! Of course, please feel free to link all you want to posts that you put up that meet the criteria! I'm glad you enjoyed this one. If you ever get a chance I'd read her Tantalize books, but know that they aren't as funny as the Feral ones.